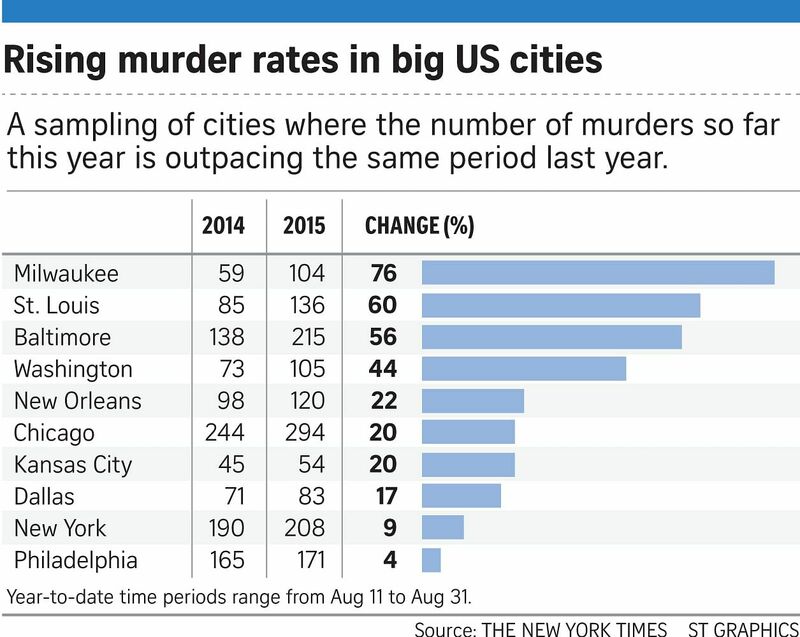 MILWAUKEE • Cities across the United States are seeing a startling rise in murders after years of declines. Some, like this city, have witnessed a precipitous shift. With the summer just over, 104 people have been killed in Milwaukee this year - after 59 homicides for the same period last year. More than 30 other cities have also reported increases. In New Orleans, 120 people had been killed by late August, compared with 98 during the same period a year earlier. In Baltimore, homicides have hit 215, up from 138 at the same point in 2014. In Washington, the toll is 105, compared with 73 people a year ago. And in St. Louis, 136 people have been killed this year, a 60 per cent rise from 85 murders at the same time last year. Law enforcement experts say disparate factors are at play in different cities. Some say intense scrutiny of the use of force by the police has made officers less aggressive and emboldened criminals, though many experts dispute that theory. Rivalries among organised street gangs, often over drug turf, and the availability of guns are cited as major factors in some cities, including Chicago. But more commonly, many top police officials say they see a growing willingness among disenchanted young men in poor neighbourhoods to use violence to settle ordinary disputes. Many top police officials say they see a growing willingness among disenchanted young men in poor neighbourhoods to use violence to settle ordinary disputes. "Maintaining one's status and credibility and honour, if you will, within that peer community is literally a matter of life and death," Milwaukee's police chief Edward Flynn said. The results have often been devastating. Ms Tamiko Holmes, a mother of five, has lost two of her children in the past eight months. In January, a daughter, 20, was shot to death during a robbery at a birthday party at a hotel. Six months later her only son, 19, was shot in the head in a car. Ms Holmes said she recently persuaded her remaining teenage daughters to move away from Milwaukee with her, but not before one of them, 17, was wounded in a shooting while riding in a car. "The violence was nothing like this before," said Ms Holmes, 38. Urban bloodshed - as well as the overall violent crime rate - remains below the peaks of the late 1980s and early 1990s. Criminologists say it is too early to draw broad conclusions from the recent numbers. In some cities, including Cincinnati, Los Angeles and Newark, New Jersey, homicides remain at a relatively steady rate this year. Yet the spikes are raising alarm bells among urban police chiefs. Homicides in Chicago are up about 20 per cent over the same period a year ago. Chicago police superintendent Garry McCarthy said he thought an abundance of guns was a major factor. "Across the country, we've all found it's not the individual who never committed a crime before suddenly killing somebody," superintendent McCarthy said on Monday. "It's the repeat offenders." Among s ome experts and rank-and-file officers, the notion that less aggressive policing has emboldened criminals - known as the "Ferguson effect" - is a popular theory. But others doubt it. Professor Richard Rosenfeld, a criminologist from the University of Missouri-St. Louis, said homicides in St Louis had begun rising last year before a white officer killed an unarmed black teenager, Michael Brown, in nearby Ferguson. Captain Mike Sack, a homicide commander in the St Louis Metropolitan Police Department, cited killings there that had grown out of arguments over girlfriends, food and even characters on a TV show. "Individuals get so upset over things that I or others might consider petty but resort to such a level of violence," he said. In New York, there have been a larger number of gang-related killings, said Mr Stephen Davis, the department's spokesman. But he also said many homicides remain unexplained. "There are a lot of murders that happen on the spur of the moment," he added.